The solid one piece aluminum wheelchair ramp is an excellent choice as a temporary ramp or when a more permanent ramp is desired. No assembly required. Its one piece design makes it ideal for wheel chairs and scooters. This ramp is all aluminum with a solid slip resistant surface. 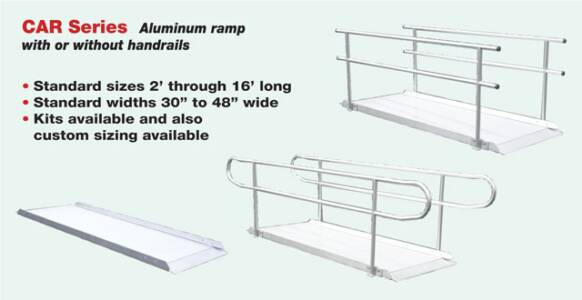 The solid ramp is available in three lengths and two widths. Custom widths are available. The load capacity is 600 pounds.